Bedford Tavern | Pub Quizzers | Find a pub quiz near you, now. 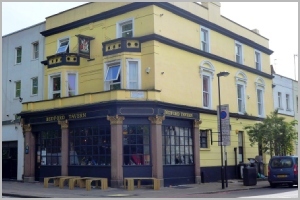 Pub quizzes take place at Bedford Tavern, Finsbury Park on Mondays (weekly) at 19:30. Entry is £2.00, you can have up to 10 people on a team. There are prizes of spot prizes, cash, drinks. Happy quizzing! Looking to brighten up your Monday evening? Look no further than The Bedford Tavern! We are giving you a chance to dazzle your friends with your strong grasp of general knowledge, alongside the opportunity to win yourself some fantastic prizes! We offer First Place a ''£50 food & bar tab'' and ''Second-to-last'' wins a bottle of house wine. But that's not the end of it! We also have 2 x bonus free drink questions AND a rolling Cash Jackpot, meaning you are in the running to take home cash on a weekly basis! Assemble the troops, every Monday, 7:30PM, see you there! We're not far from Finsbury Park or the Holloway Road. There's no limit on team size but in the interest of fairness, a points deduction system kicks in for teams bigger than 6 players.